i was doing so good about blogging regularly but it's been an incredibly busy 3 weeks or so at work so i've just had nothing but school on the brain. i dream about it, wake up thinking about stacks of paperwork, and drive to school thinking about what i should do in my class today because i didn't have time to make a lesson plan, drive home after staying an hour later at work than i'd planned, fix dinner, sleep, and start the whole thing over again. and watch an occasional football game or 2 or so. anyway, today i did a lesson with my social development class that i loved so i thought i should blog about that since i have nothing else to blog about. this class has all of my students with emotional disturbance or behavior disorders and we're doing a unit on self-awareness and self-management. one of the objectives of the unit is that students will learn to think from others' perspectives, or to put themselves in others' shoes, which, as you know, is really hard for almost all teenagers to do and next to impossible for emotionally disturbed teens to do! the part of the brain that deals with empathy is not fully developed until adulthood, which explains why many teenagers act like sociopaths. i'm being dramatic for comic effect...sort of. so today, we did a"putting-yourself-in-someone-else's-shoes" activity. i did a photo history of john lewis, starting with a photo of the young activist john lewis marching in protest of segregation in the south during the civil rights movement in the 60's (this picture was actually AFTER the "bloody sunday" incident, when john lewis left his hospital bed to finish the march...pictured on the right in the blue sweater). we discussed the background of peaceful protests, sit-ins, freedom rides, marches, etc. then i asked my students to think about how they would feel if they were in john lewis' shoes: what would they be thinking while they marched? how would they feel? what would they see? what would they hear? they talked about feeling aching feet, tired legs, but feeling strong because what they were doing was important. some students said they would feel scared because of walking through the south as a black man and some said they would feel unafraid because they weren't marching alone. the next picture i showed was of the state troopers that waited for the unarmed marchers on the other side of the bridge and then began hitting people with clubs, and john lewis on the ground trying to cover his head from the blows. the next picture was of john lewis, with a bandage on the back of his head, being arrested and thrown into jail. 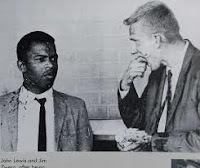 then, a picture of john lewis next to a young civil rights activist (a white man), both splattered with blood. for the first time all year, every one of my students' eyes were glued to the images, they did not look away. they asked questions about rosa parks and lynchings and brown vs. the board of ed and segregation and slavery (one student asked if i thought slavery came naturally to people back then and why was it that the black people were taken as slaves...hard questions.) and harriet tubman and the underground railroad. hello! do not get me started talking about history, i won't be able to stop! the last picture that i showed was a picture in 2008, washington, d.c. the mall crowded with millions of people and newly elected president obama walking down the steps of the capitol building balcony to give his inaugural speech. but he stops and hugs a man from the crowd as he passes. this man is, now older, now a CONGRESSMAN, john lewis. i asked the students: what do you think he felt in this moment? what did he see around him? what did he hear? what was he thinking? they said that he probably felt overwhelmed, joyful, proud, emotional, but in a good way. 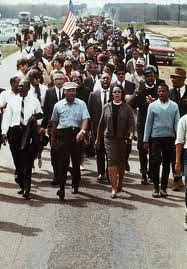 then, i read to them an article that congressman lewis wrote about how he felt on that day and what it meant to him. we talked about how president obama is proof that peoples' attitudes can change and that our country is able to learn from past mistakes and that even people who didn't agree with obama's politics celebrated on that day because of what it meant for this country, that his election could occur in the same lifetime as segregation and jim crow south and heinous acts of discrimination. imagine! just imagine what john lewis has witnessed in his very own lifetime! 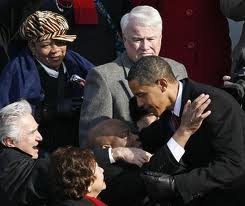 congressman lewis is one of my favorite people in the history of our country and i was overcome with emotion when i saw him on the balcony of the capitol building, hugging president obama. i love sharing his story with students and i want them to put themselves there, in his head, in his shoes, and learn to see from others' perspectives and empathize and learn that history is important because it's a chance to learn from the mistakes of the past and apply these lessons to their own lives. i want them to know that there is a place for protesting, and expressing their opinions, and raising objections, and defying social norms and that is when it is for the common good, for human rights. my students can be particularly defiant, oppositional, argumentative, deviant. most of the time they are labeled "bad kids." but maybe there's a place for defiant, oppositional, and argumentative people, if only we would learn to direct our passions at a worthy purpose!